Marvel Won’t Publish ‘Fantastic Four’ so DC Will. Make way for the Familiar Four! As far as trolling goes, this is impressive. Marvel Comics no longer publishes a “Fantastic Four” comic. It’s all part of a scheme to devalue the property enough so that 20th Century Fox will stop trying to make terrible film versions about the foursome and allow the rights to revert back to Marvel Studios. Me, I’m Old School, I believe some money is always better than no money, but what do I know? Not enough for the House of Ideas, and then again, who is to say that monthly comic sales have any impact on how a film is received? DC’s “Wonder Woman” for decades pulled less than Amazonian numbers, but the big budget film last summer won critical acclaim and broke all kinds of records. Marvel’s decision to drop its flagship title is just one of a legion of errors that help explain why the company is once again rebooting its titles in less than a year. But if Marvel won’t give the world a Fantastic Four, DC will. Behold the Dark Negative Multiverse Zone. Something like that. In “The Terrifics” No. 1, cover date April 2018, Mr. 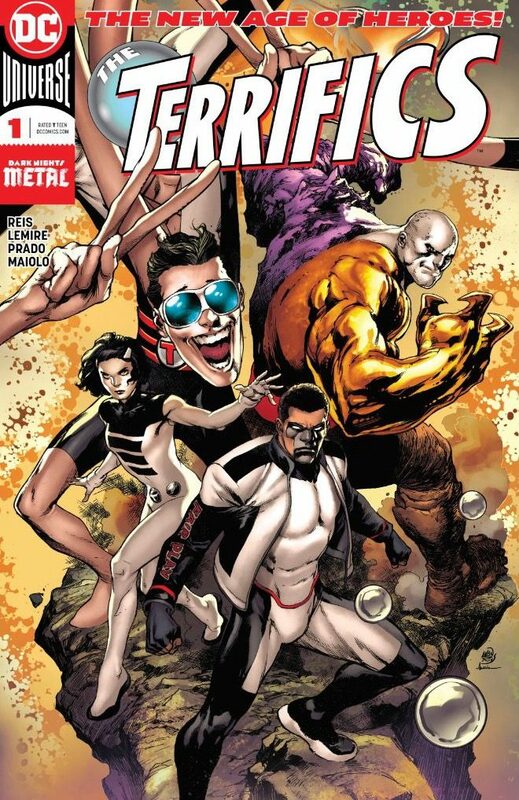 Terrific is joined by Plastic Man, Metamorpho and Phantom Girl. Well, a Phantom Girl, not the Phantom Girl. See what DC did there? Mr. Terrific has all the brain power of Mr. Fantastic and then some; Plastic Man, his stretchy powers; Metamorpho is this team’s Thing and Torch, a behemoth with the powers derived from the periodic table; Phantom Girl can’t just drop out of sight like the Invisible Woman, but she can become intangible, which is impressive in its own right. What brings this kooky quartet together? That’s still being worked out. Encountering an interdimensional breach at Stagg Industries, Mr. Terrific, Plastic Man and Metamorpho are sucked into the Dark Multiverse, a place which sure looks like the Negative Zone. 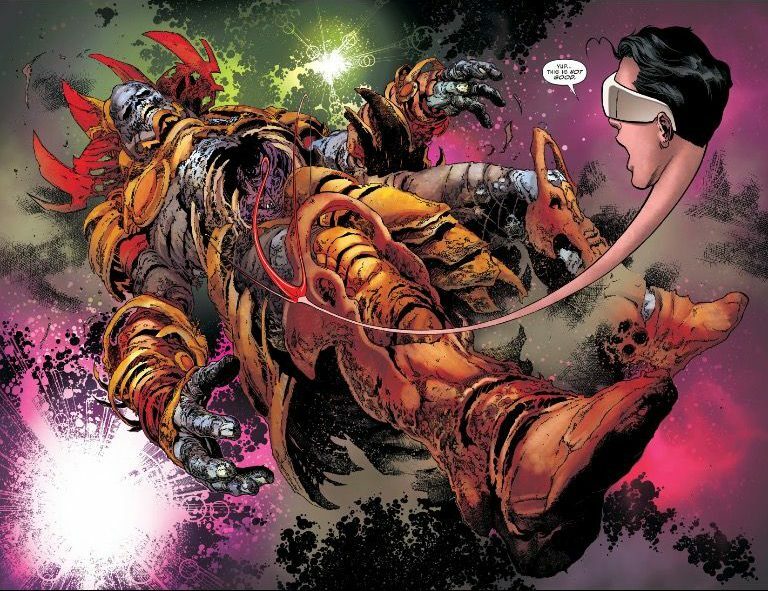 There, they encounter the body of a colossal being who looks like Galactus being overrun by angry space critters. There is one living sentient person there: Linnya Wazzo, a resident of the planet Bgztl (presumably making her a distant relative of Tinya Wazzo, the 30th Century’s Phantom Girl). She’s trapped in her intangible state. The all-new, kind-of-same Phantom Girl. Mr. 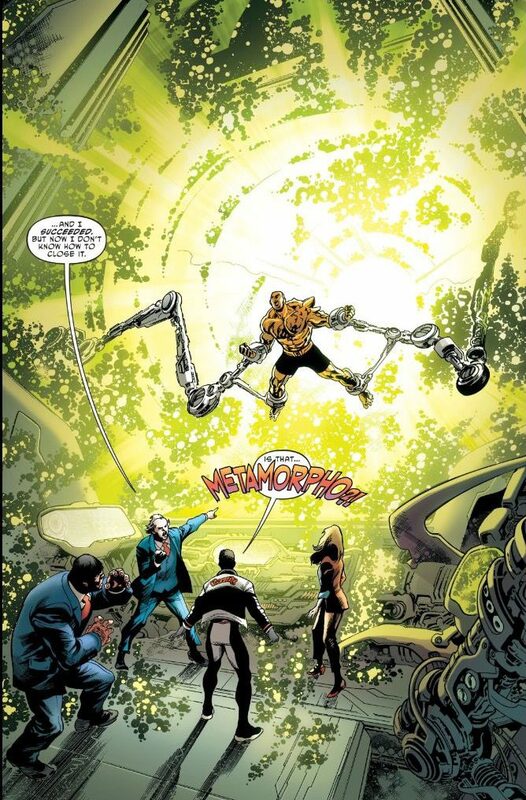 Terrific is able to activate a beacon with a message from Tom Strong warning that they alone must save the universe. And that might be the issue’s biggest surprise, that Alan Moore’s creation is now part of mainstream DC continuity. But, hey, if the Watchmen are, anything seems to be fair game. My biggest complaint about this issue is that the story lasts about as long and seems about as deep as a butterfly breath. Still, there are worse things to aspire to than the best of Stan Lee and Jack Kirby’s collaboration, and Jeff Lemire and Ivan Reis have set the stage for what could be a fun space opera. Maybe DC should slap a “World’s Greatest Comic Magazine” banner on the masthead while it can. It’s not as if anyone is using it. This is what happens when cosmic beings overeat. A Comedian Told Some Jokes. Get Over It. I picked this up last week and agree that it was a bit light on story, but I’m really hoping it’s a scene setter and that Lemire has bigger plans. I just realised: Lemire’s writing Marvel’s Fantastic Four at DC as The Terrifics; at the same time he’s writing DC’s Justice League over at Dark Horse with Black Hammer.